There's this really beautiful village in New Mexico called Cloudcroft, just a few hours from Lubbock. My family used to take trips there sometimes when I was a kid; if it was a special trip, we'd stay at a fancy old hotel called The Lodge. We always looked forward to these trips - there was a pool with a view of the mountains, a gift shop that had an old drugstore-style candy counter, and hiking trails to explore. Most exciting to us, though, is that the hotel is said to be haunted by a beautiful redheaded ghost named Rebecca. As you know if you've met my wife, I've got a weakness for redheads... More than once, we tried to convince our parents to let us leave the room late at night to try and spot her. When I heard about The Innkeepers, the kid inside me who had always hoped to see Rebecca came back, and I knew that I was going to watch it for this year's project. It's directed by Ti West, whose movie The House of the Devil I watched during the first Project Horror. 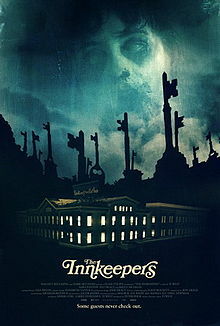 The Innkeepers is set in a formerly grand old hotel called The Yankee Pedlar Inn, which is about to go out of business. Only two employees, Claire and Luke, are working during the hotel's final weekend of operation. Both are interested in ghosts, particularly the ghost of a jilted bride who is said to haunt the Yankee Pedlar. Between their job duties, they plan to spend the last weekend trying to collect some kind of evidence of her existence. The hotel's final guests add to the hotel's spooky final weekend. One is a psychic who gives Claire a warning about her search, and the other is an old man who insists on staying in a specific room for his own reasons. I don't want to say too much more, because the fun in this movie is in seeing how all of these elements end up coming together. If I have one complaint about this movie, it would be the same as the complaint I had with The House of the Devil: the pacing. There's a whooooole lot of build-up before the movie finally reaches its payoff. I felt like the payoff was worth it once it arrived, but it still would have been enjoyable to get a few more crumbs along the way. Also, I'm pretty tired of horror filmmakers who use the equation character tiptoeing down a quiet hallway + mysteriously slammed door = SHEER TERROR. You can also substitute "door opens but nothing's on the other side" into that equation. But those are pretty minor complaints, and overall I really liked this movie. Sara Paxton, who plays Claire, does a good job of showing how she gradually becomes too absorbed in the ghost hunt, because it is the only thing she has to hold on to. The psychic's vision ("there are three" and "she can't be saved") is delivered in a way that you think you have its meaning figured out, until it ends up meaning something else entirely. Add in a couple of scenes that are pretty funny, and it rounds out into a pretty good haunted house movie. I feel like I may be acting too generously, but after yesterday's 1/5 rating, I'm ready to give this one five spooky pianos out of five.